The first bridge that was built at this site was part of a plan in 1847 to provide a continuous route through Lyon with bridges across the Saone and Rhone. The current bridge on this east-west route is a three span steel I-girder structure that was built in 1965. The Pont Gallieni was named after a 19th century French military officer, Joseph Gallieni. An earlier bridge was named Pont du Midi but that was changed to Gallieni at his passing in 1916. In the Google earth photo above we can see the Saone and the Rhone with an elaborate transportation system on the Presqu'ile, the peninsula between the bridges. The highway bridges are to the north and the railroad bridges are to the south. 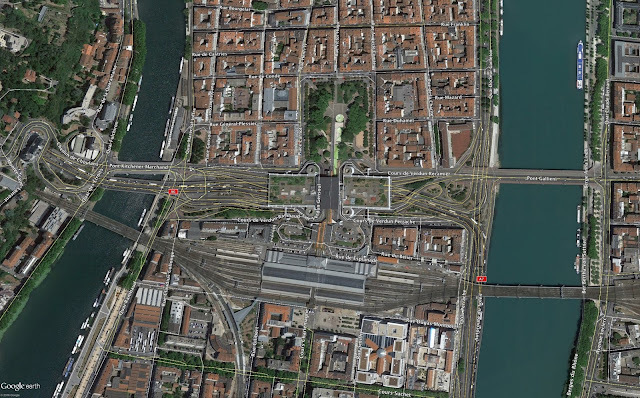 The Pont Gallieni lost two of its traffic lanes to a tram system in 2001. The Pont Gallieni has seven steel girders with straight girders on the approach spans and haunched girders on the center span. The girders sit on nicely tapered stone piers. I think stone is Lyon's favorite building material. Exposed stone is used for a walking surface and walls on the quays and no matter what the age of the bridge, it seems to have stone piers and abutments.